Paint the Pavement is a nonprofit program whose mission is to improve pedestrian safety at busy intersections. To do this, they facilitate an event where the local community paints murals at these intersections, intending to bring neighbors together and slow down drivers at the same time. Bringing Paint the Pavement to Pittsburgh presented a unique opportunity. Neighborhood identity is a point of pride for many Pittsburghers, so I thought that appealing to that pride was a good way to drum up project participation. With this in mind, I design a three component branded campaign (posters, a landing page, and an informational packet) centering around the idea of being a good neighbor. The posters advertised Paint the Pavement as an organization, the landing page was a central hub for forms and information, and the information packet provided all the tools they needed to get started. For this project, I started with a 10 page document of unformatted text. It was my job to take the text, rearrange it, and format it for clarity and narrative. All text and required logos had to be present in some way in the final product. For me, all of the visual vocabulary and tone stemmed from the information packet. It was the center of this system. I chose bright colors and thick rounded fonts to keep the visual system friendly. My other graphic element was a dashed outline of Pittsburgh, which both added visual texture, and also reaffirmed the project’s local focus. After sorting all the written information, I also knew that written tone was just as important as visual tone. The packet’s language had to be as friendly as the neighborhoods felt. After making paper models of several different forms, I settled on a packet that gradually unfolded as the information increased. This was also for tonal reasons, as well as pacing. There was a lot of information that needed to get across. I used the form to physically slow down interested parties to make sure that they took time reading everything. This form also allowed me to walk interested participants through my narrative, controlling what information they saw when. Finally, as the packet unfolded, it seemed an apt visual metaphor for the kind of good that can unfold from a community charity project like Paint the Pavement. Once the packet was on its way, I began designing the posters. These posters would hang in bus shelters, and the posters would be specific to the neighborhood they were hung in, and the call to action (e.g. 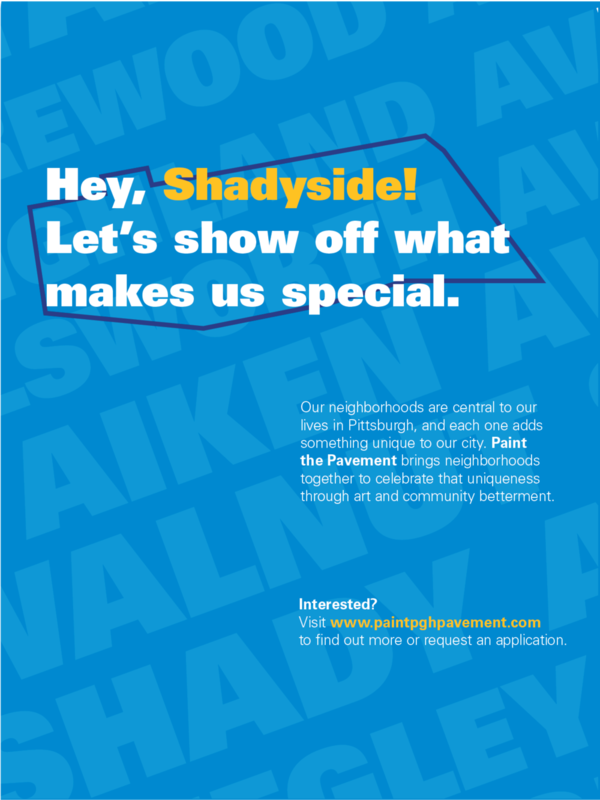 “Hey Shadyside!”) was intentionally personal. The background texture of each poster are also that neighborhood’s major streets, a nice in joke for residents. Finally, I kept the landing page simple, since it was the step right before the hefty information packet. Its primary purpose was to deliver materials to interested parties, so I kept those forms and links front and center. The result was a tight visual system, with each part doing exactly its job.